There are times in our lives when we can get confused, make assumptions that aren’t true, miss the forest for the trees. We can find confusing things all around us. Things like why some TV shows actually make it to the air, why are the Kardashian’s even relevant, and for gosh sakes why do we still have fax machines. The same holds true for pick-up trucks. There was a time when pick-ups were only offered in basic versions. 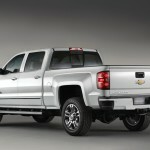 Nowadays however pick-up trucks are offered in an almost dizzying array of styles, configurations and sizes. Take the Chevy line-up for example. It almost seems one needs to take class to figure out all the types offered. Make no mistake they are all good trucks, but there are varying levels from the 1500 to the 2500HD and the 3500HD. 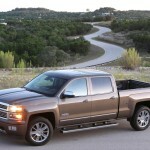 There are the WT, LT, LS and LTZ trims and crew cabs and long and short beds. 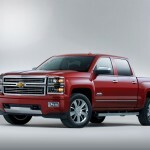 We mention this because recently we had the 2015 Chevy Silverado High Country. 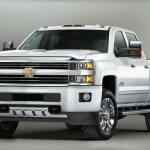 We liked, it, a lot (more about this in a moment), but we also had a Silverado the month prior. 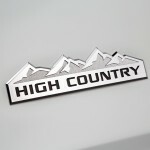 At first glance it appeared that the High Country had a great deal more than the Silverado we had the month prior, including a larger engine, yet this one was priced less than our previous one. It was after we dug a little deeper, began looking at the forest instead of the trees, that we saw the difference. The model we had the month prior was the 2500HD, this latest the 1500. The 1500 is a little less Heavy Duty with less towing and payload capability. 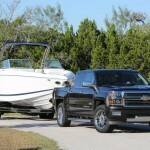 Given the fact that the 2500 is more heavy duty (17,000 pounds towing for example), and the 1500 is considered lighter duty (12,000 pounds towing), thus costs less, allows an owner to pack in more features and options. Okay, we get it now. The 1500 models are also more nimble, and a little easier to maneuver. Once all these differences are known we could began to see it for ourselves. Indeed the 2500HD is more of a working truck, the 1500 more of a balance between getting stuff done and carrying the family around in comfort and style. We can see a concrete mixer on the back of the 2500HD on the way to the job site, a boat on the back of the 1500 on the way to the lake. Now we can dive into what we liked about the 1500. The 1500 offers a mix of three cabs and three boxes. Standard cabs are unchanged from last year, but the extended cab is now a double cab with forward-hinged rear doors. The 6.5-foot bed from the double cab is optional on the crew cab. My pick-up truck friends tell me this a rare and useful configuration although you do end up with a pickup almost 20 feet long. 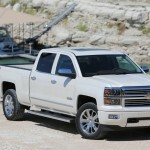 The 1500 trims include the WT (Work Truck), LS, LT and LTZ trim levels, along with Z71 and High Country models, All three cab styles and box configurations are available in WT, LS and LT trim, with LTZ reserved for double and crew cab models. Standard features on all models include cruise control, power locks and windows, and AC. There are several packages available depending on the trim level and can add things such as duel-zone AC , Keyless entry, back-up camera, satellite radio and navigation, Bluetooth and OnStar. There also several USB ports plus both 12-volt and 110-volt power outlets, and most models include a 4.2-inch color Driver Information Center. New for this year is an Enhanced My Link version adds text-message alerts, Siri Eyes Free, and an available OnStar 4G LTE hotspot. 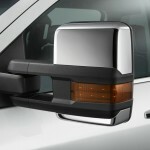 WT models feature black bumpers, door handles and outside mirrors. Chrome bumpers are standard on LS, LT and LTZ trims – and available on 1WT – with chrome door handles, mirror caps and body side molding standard on LTZ. 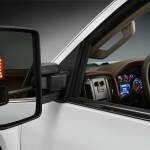 Heated, power-adjustable and driver’s side spotter-equipped outside mirrors are standard on LS, LT and LTZ, with a power-folding feature standard on LTZ. 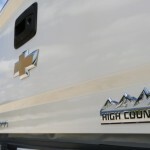 The High Country, the model we had, builds on the LTZ trim and adds a unique chrome grille with horizontal chrome bars, halogen projector headlamps and body-color front and rear bumpers. There are 20-inch chrome wheels with P275/55R20 standard all-season tires, and chrome body side moldings, door handles and mirrors. 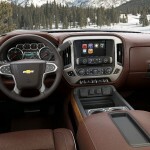 Inside, there’s an exclusive saddle brown interior, along with heated and cooled perforated premium leather front bucket seats with High Country logos on the headrests, wood trim, Chevrolet MyLink connectivity with an eight-inch touch screen, Bose premium audio and front and rear park assist. The cabin seems nearly identical to the 2500HD interior with lots of storage and controls within easy reach. The gauges are well laid out and easy to read. 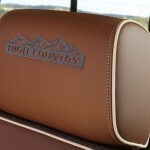 However the High Country interior seems to deliver little more comfort and luxury. Perhaps it’s the 10-way power seats or that premium leather or the wood trim. The rear seat passengers we had during our week were also very comfortable and reported plenty of room. Our model also had the rear-seat entertainment system with BluRay/DVD player and a sunroof. There was also a navigation system and a High Country Premium Package that added a heated steering wheel, power adjustable pedals and Driver Alert. 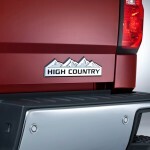 The High Country also has a power-sliding rear window; something we could never decide would ever come in handy. 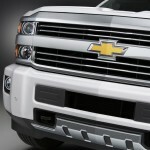 The standard powerplant on all but the LTZ trims is a 4.3-liter V6 making 285 horsepower and 305 pound-feet of torque. 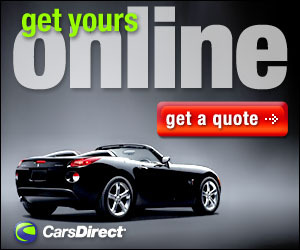 It’s mated to a six-speed automatic transmission and either rear-wheel or four-wheel drive. 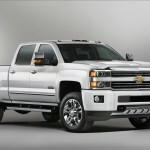 Then there is a 5.3-liter V8, which is standard on the LTZ trims and optional on other Silverados, that makes 355 hp and 383 lb-ft of torque. It also comes with a six-speed automatic and the choice of two- or four-wheel drive. 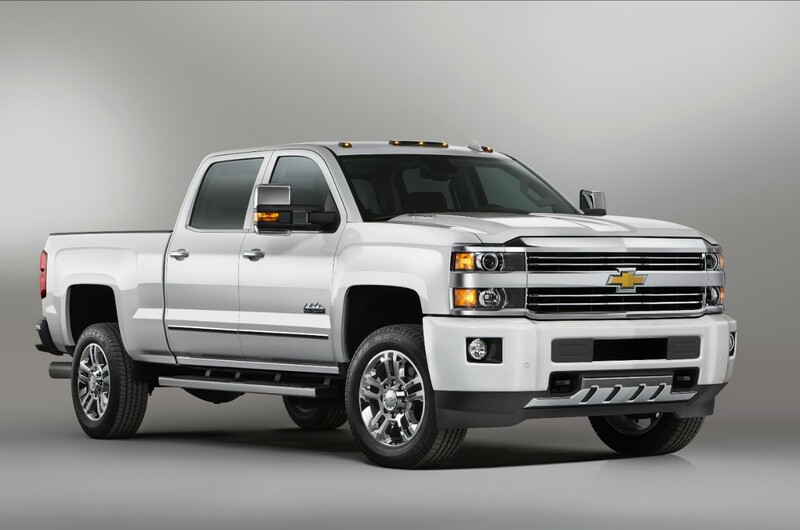 Optional on the LTZ and High Country trims is a 6.2-liter V8 that makes 420 hp and 460 lb-ft. It’s paired to an eight-speed automatic transmission. This was the configuration we had for the week and after a little research learned that this is basically the same engine as the V-8 in the new Corvette Stingray. The only differences being an 8.5-quart oil capacity (the Stingray’s is 7.0) designed to support the heavier loads involved in truck use and of course the difference in weight between a Vette and the Silverado. There was also another noticeable difference on the road between our 1500 and 2500HD models. Our 2500HD had the Duramax 6.6L turbodiesel and Allison 1000 six-speed automatic transmission rated at 397 horsepower and 765 lb.-ft. While that diesel engine was agile and delivered good power on the road, the 1500’s 6.2-liter 450 hp was surprising. As in a 0-60 time of 5.6 seconds, in a truck weighing nearly two and half tons surprising. That’s an eye opening, somewhat white knuckle experience. Make no mistake though this is a full size truck that can’t be thrown around curves like its Stingray cousin. On the road though the higher view and agile suspension combined with the 6.2 liter engine is comfortable and adequate, although parking in a busy parking lot can still be a challenge. At the end of our week we found that the 1500 in the High Country is a great full-size truck; others who had the chance to ride in it agreed. Everyone, myself included, came away impressed with the ride, the comfortable interior and the overall look. Both the 1500 and the 2500 would be a great choice depending on your needs. Need a heavy duty work truck? The 2500 is worth a try, for those needing a little less, and who want comfort and style, the 1500 High Country needs to be on your shopping list. Now if we could only figure out just what the heck women see in Russell Brand. Engine (as tested): 6.2L V-8 with 420 horsepower and 460 lb-ft of torque.